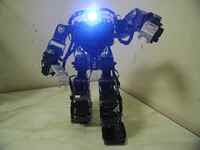 TINYWAVE, champion Robot of ROBO-ONE Light 1st put on the market in Japan on March 26, 2010. The robot is not a kit but just a constructed product. ROBO-ONE Light 1st, sponsored ROBO-ONE Committee, took place at Institute of Industrial Promotion Kawasaki Hall on Mar 20th, 2010. ROBO-ONE Light is robot fight tournament for robots on the market, which are officially recognized by ROBO-ONE Committee. Beginner, who got robot from the market and want to attend the ROBO-ONE Tournament, also can attend the competition. Sixty-two robots entered in the tournament, including 20 robots from the Republic of Korea. Six custom-built robots joined and others were officially recognized ones. The best 8 robots were all kit robots such as 4 KHR-3HVs, 2 Bioloids and 2 TINYWAVEs. The winner was fruit (TINYWAVE). 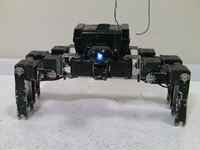 TINYWAVE was developed by Jeon chang-hoon, Chamipon of ROBO-ONE KOREA and Tomio Sugiura, famous for robot builder of ROBO-ONE GP Robot, Dynamyzer. The constructed products are made from SUGIURA MACHINE DESIGN OFFICE.